Every year, the PepsiCo Canada Foundation hosts golf tournaments where the proceeds are donated to Canadian charities supporting the health and wellness of children. This year, it’s their 25th annual tournament and the PepsiCo Canada Foundation chose Canadian Feed The Children as a new partner charity! Why is the Foundation a believer in giving back to the community? We are run by Canadian employees who volunteer their time and feel that being involved and giving back to the community is crucial to our success as a business. In fact, giving back to the community is built into our organization’s mantra and it is part of our pillar and purpose. It’s important for every organization and its employees to give back to the community to help change the lives of the people around us. As well, it helps build employee morale around the organization because we’re all working together for a common cause. Why did you decide to pick Canadian Feed The Children as one of your charities? We raise funds through three golf tournaments to support children and youth who might not have access to active and healthy living programs in their communities. We were looking to partner on a program with an Indigenous community and felt that Canadian Feed The Children’s partner Keeseekoowenin First Nation in southwest Manitoba was a perfect fit, since their programs get children and youth involved in gardening and farming. You recently visited Keeseekoowenin First Nation and met community members there. Tell us about your trip! 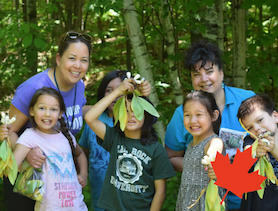 I visited Keeseekoowenin First Nation with the Canadian Feed The Children team in June and was blown away by the level of engagement the children and youth are having in farming and gardening. It was eye opening to visit the community and see how remote they are and how difficult it can be for them to access important services. I was able to see how the community’s partnership with Canadian Feed The Children is helping to create sustainable change for children’s health and wellbeing. Were there any highlights from your visit? 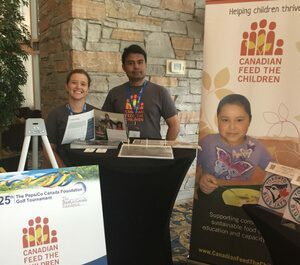 Michelle Vinokurov, Senior Manager Major Gifts and Fawad Iqbal, Development Coordinator, proudly representing Canadian Feed The Children at the PepsiCo Canada Foundation golf tournament. It was great to see Keeseekoowenin’s farm fields ploughed and a greenhouse that was newly constructed already being used to grow plants. I’m excited about what is happening in the community and the development of new skills and assets that will help enhance food for youth. What do you hope is achieved through this partnership with the community? By partnering with Canadian Feed The Children as one of our charities, we are looking forward to focusing on the Keeseekoowenin community and providing some continuity there with ongoing programming. We want to see children thrive in the program. When was your annual golf tournament? How did it go? It was a sold out event on July 24th with 288 golfers participating. We raised $342,000 for our charity partners! 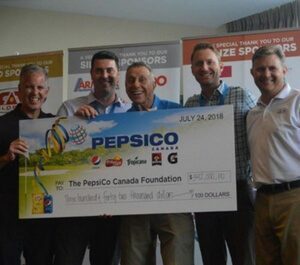 HUGE THANKS to Denis Sacks and everyone at the PepsiCo Canada Foundation for your incredible support. You are helping so many children in Canada thrive! 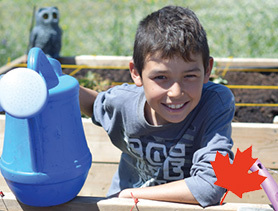 Your company can help children thrive in Canada too! Learn more about Workplace Giving here canadianfeedthechildren.ca/ways-to-help/workplace-giving/ or contact Fawad Iqbal at 1-800-387-1221 ext. 245 or [email protected] to get started. Traditional First Nations activities like food gathering and preparation activities are a fun and educational way to connect students with community Elders and their culture. Sponsor a child for just $29 per month and give a child hope. Every. Single. Day.